Every day our world is becoming more connected. From our vehicles to our homes we experience the convenience and benefits of living in an increasingly connected world. Connected work zones, or "Smart" work zone technology has been evolving over the past 10 years and GEWI has been involved from the beginning. GEWI's TIC Software was first used in a research project involving connected work zones in 2010, and demonstrated at ITS World Congress 2011 in Orlando. Today, road agencies are realizing the benefits real-time work zone information provides for safety as well as generating data that can be used for future work zone planning. In this issue, read more about projects involving smart work zones and statewide work zones involving municipalities. GEWI's Executive Director Matthias Defée has been very involved with the development of TIC features used for work zones. Read more about him in this issue and watch a video to learn more about how TIC CONNECTS - Road Agencies and Work Zones. Should you have any questions about anything in this newsletter, please contact us at info@gewi.com. 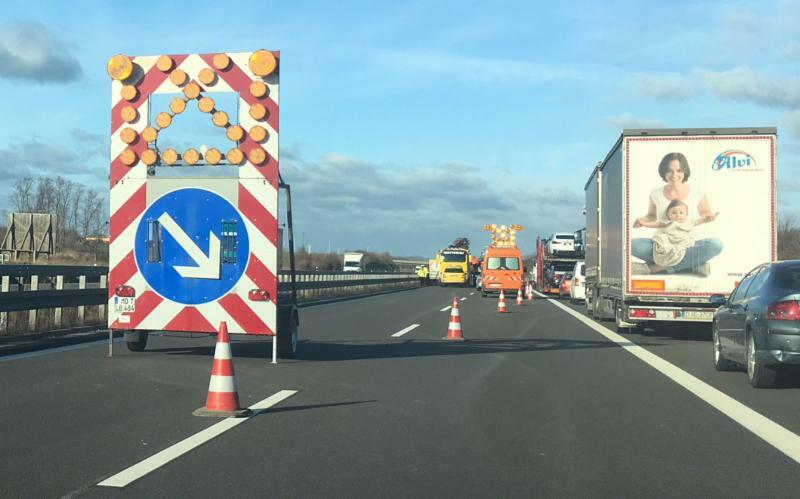 Regional Development and Transport of Saxony-Anhalt to implement measures to reduce accidents in work zones. GEWI's TIC Software will collect data from construction vehicles and warning trailers to identify work zone locations and lane closures in real-time. This information is then delivered to navigation devices, VMS signs in the construction area, to broadcasters and other systems and organizations. The goal is to increase work zone safety by distributing this information across a wide range of information channels. GEWI's first involvement in a Smart Work Zone project was 8 years ago in a demonstration project called DIANA2 which included GEWI, BMW and Hessen Mobil, the Federal States Road Authority in Hessen, Germany. The project demonstrated the Local Hazard Warning (LHW) capabilities of TPEG technology which is used to deliver traffic and other information into vehicles. GEWI's TIC Software product was used to collect data from roadwork vehicles which transmitted vehicle position, speed, lane closure details, position of the arrow sign, and more. This information was then transmitted directly to the traffic management center and to the vehicle's navigation device to provide drivers advance warning of the work zone conditions and appropriate advice. This past experience and development of the TIC Software means today TIC can easily be configured to collect these new Smart Work Zone data types along with cameras, VMS signs information, crowd sourced data, and more to enable Work Zone management by the public agencies. Click here to watch a short video about TIC for Work Zones, or for more information contact your local GEWI representative. 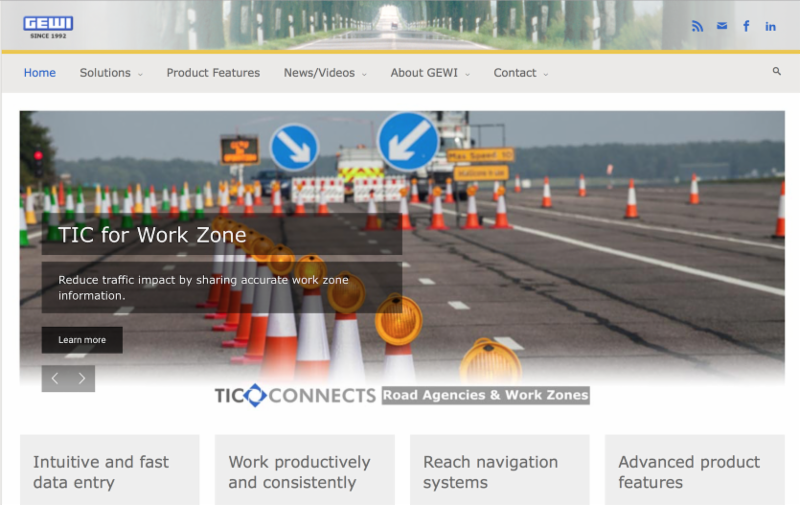 The Road Authority for the German state of North Rhine-Westphalia, a federal state in Germany has implemented the GEWI TIC for Work Zone solution to allow all municipalities of the federal state to enter work zone data. The data from the municipalities, in combination with the data for the State Road Authority provide a complete, seamless view of work zones across the various legal and organizational entities. This coordinated effort facilitates efficient work zone coordination for the planning and operation of every project state-wide. The system is hosted by GEWI and is also made available to the state traffic web portal to provide current work zone conditions to the traveling public. Government public road agencies and commercial toll road operators need to check traffic and travel impact and avoid possible conflicts during joint multi-agency work zone planning and operations. Travelers then need to be informed, both in advance of, and during, work zone operations. Information about work zones can be collected, harmonized, and consistently shared including durations, closures, and travel restrictions. Agencies can better monitor and analyze work zone performance with accurate detailed data. 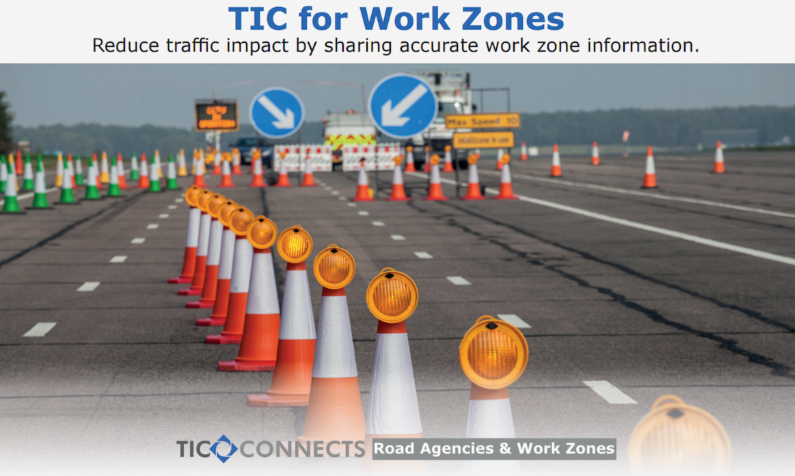 As an all-in-one system TIC can support many types of related work zone information, including information from other agency projects on different road classes. For example, traffic control permits, traffic conditions and incidents, local cameras, VMS messages, and public information can be shared. 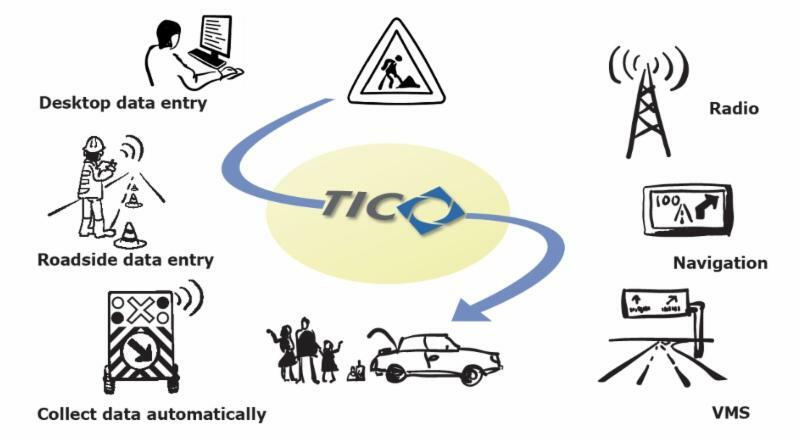 TIC can be used to work on multiple projects in the same system at the same time, all related across the same road network, even across administrative borders. TIC projects can also be related and connected. 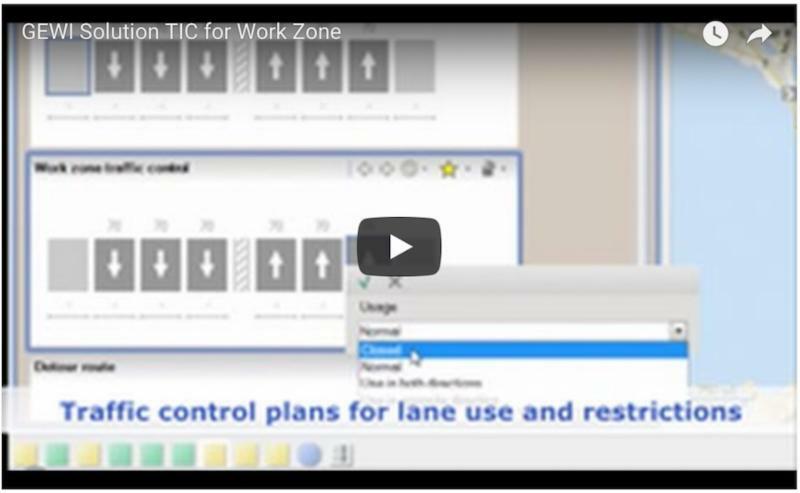 TIC operators can quickly specify required work zone traffic controls based on traffic control templates and detailed road map data, including closed and reassigned lanes, widths, speeds, weights, and other restrictions. Once implemented, information about the actual traffic controls can be verified or updated, and then shared. TIC can even be used to create traffic control permit documents easily by using custom templates. TIC can be configured to simultaneously support and coordinate multiple teams, and can include other departments, agencies, and organizations within harmonized processes. Over the past 25 years GEWI has become recognized as a global leader in traffic and travel information software and as the TIC product has added solutions and product features it has become more challenging to describe the many ways TIC can be used as a solution. What today is known as TIC (originally for Traffic Info Centre, but now evolved into much more), was developed in its first generation as TMC Office when it was initially deployed in 1997. Now in its fourth generation, TIC has evolved into a true commercial off-the-shelf solution (COTS) for many markets described on the GEWI website. Click the links below to view each TIC Solution page online. Traffic and Travel Information Services. We invite you to visit the GEWI website for the latest news, product features, videos, and events at www.gewi.com. GEWI's web site includes videos for many of the TIC Solutions using TIC product features. 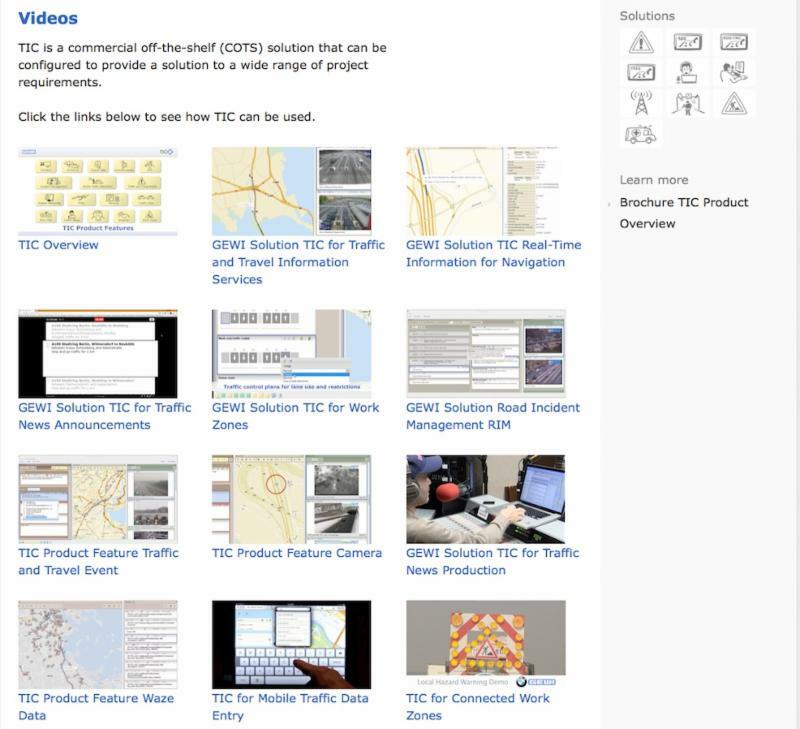 These videos make it easy for website visitors to self-demonstrate the TIC system and to view how specific product features can be used for a variety of public and private sector markets. Matthias Defée joined GEWI as Product Manager in 2002 and over the years has advanced through the positions of Business Development Manager and since 2008, Director of Customer Projects, Worldwide. In 2017, Matthias was promoted to Executive Director and has added responsibilities for finance, human resources and strategic planning for GEWI. Matthias was an excellent choice for his new position as he holds both a degree in Computer Science and an MBA. His education, combined with 15 year history with GEWI provides the background, skills and experience to understand both the technical and business requirements involved in the increasingly complex traffic market. Over the years, Defée has managed many high profile projects including Viasuisse (Switzerland), Dubai Road Transport Authority (UAE) and recently many Work Zone projects such as in Hesse and North Rhine Westphalia (Germany). He is also responsible in dealing with the strategy and implementation of GEWI's hosted (cloud) solutions.